Do you have piles of holiday catalogs? 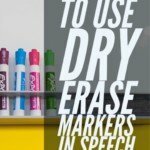 Now you can use them in speech! Say what?! You mean you can recycle, work on goals, and still have fun?! YES! Just grab some holiday catalogs that are clogging your mailbox and some paper bags (I have a stash from the dollar store always in my therapy room) and you are good to go! Just gather the catalogs. Grab the bags. Write what you want the goals to be on the bags (I used both sides of the bag to be able to use each one in more than one way). I am all about using one activity all day long (or all week long) to work on a variety of goals, with various levels. This activity works especially well for mixed groups. You can go through the catalogs ahead of time to cut out fun items but you can also have that be part of the task! I had groups go through the catalogs themselves to find items they would want or just look pretty! We were able to elicit conversations while browsing the catalogs. I put on music, we sat back, and had fun! We talked about who would like the various gifts, if they were good gifts or bad gifts, and talked about where they can go to buy the various gifts. How to utilize this activity? As we located gift and discussed, we were able to cut them out and sort them into the various bags that represented what we were working on! 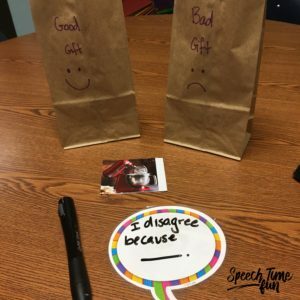 For example, if we were discussing who we could shop for, we were able to cut out the gifts and place them into the bags “for mom” or “for me.” I used dry erase speech bubbles to show students how to think about their thinking and to model how to express their answers! 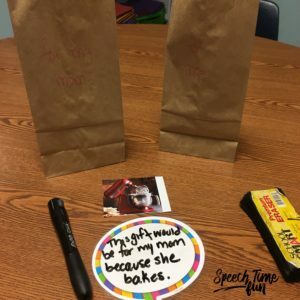 As you can see, it says “This gift would be for my mom because she bakes.” Therefore, we were able to use perspective taking, respond to “who” questions, and even express complete and complex sentences! WOAH! We even had fun locating good and bad gifts (which was written on the opposite sides of the “for mom” and “for me” bags! Again, I used the dry erase speech bubbles to show how to express responses and think about thinking. 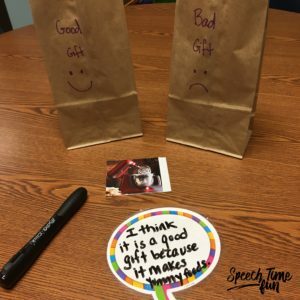 It says, “I think it is a good gift because it makes yummy foods.” I used this activity to work on describing, perspective taking, and eliciting academic discussions! We were able to agree and disagree with each others’ responses! I used cloze sentence strips so students can come up with their own answers but still use the academic language. 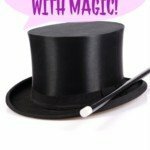 Want to work on describing or adjectives? Just put your visuals or prompts right on the bag! As students locate and cut out the pictures, they can describe the gifts! I used the stickers from my Expanding Expression Tool and placed them right on the bag! 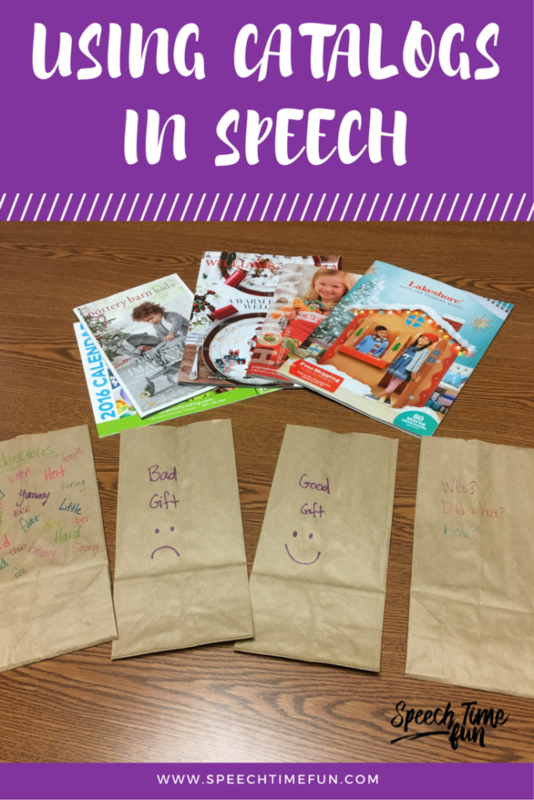 Students were able to practice their strategies for describing using the EET and have fun placing the gifts in the bag. 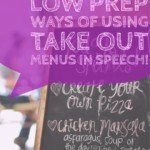 Want to work on describing? On the OTHER side of this exact bag above, I placed various adjectives! Students had competitions to express as many relevant adjectives as they could to describe the gifts they cut out. We also had fun expressing synonyms and opposites too (I used same colors to represent the opposite pairs to assist my students). 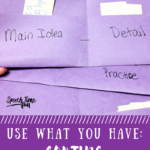 Want to work on sentence structure or answering WH questions? 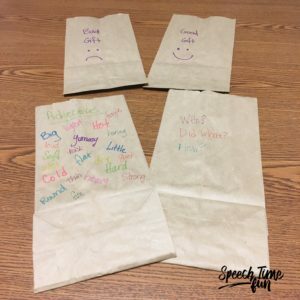 I provided visuals for sentences right on the bag! I wrote “who” “did what” “where” “when” “how” on the bags. One side I wrote prompts for a more complex sentence and on the other I simplified it! Then, I used my fun dry erase speech bubbles to model how to take the gift and visuals to create a sentence! “My mother bought the pillow at the mall on Sunday.” As you can see, we also worked on verb tenses! 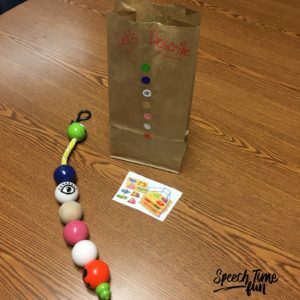 Having two different levels on one bag allowed me to easily modify this activity to meet the various needs of the students in one group and groups throughout the day! 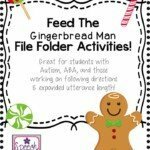 Excited to try out this activity with your students? Start collecting those catalogs! Bring them into work! Put on fun music, grab some scissors and brown paper bags and you are ready! 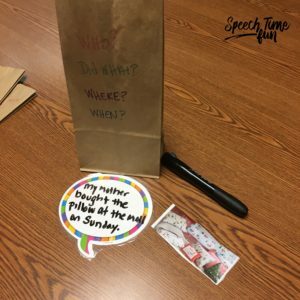 How fun to be able to use one material to address a variety of speech and language goals throughout the day! 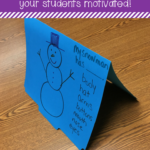 Since this activity is also relevant to the time of the year, it is fun, motivating, and you will see great results!